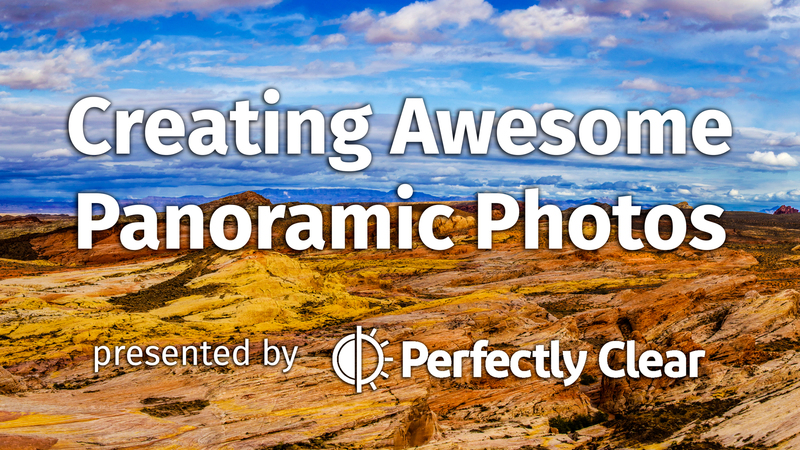 In this free webinar, you’ll learn the essential skills to create awesome looking panoramic photos. Join Photofocus editor Rich Harrington as he shows you how to shoot Panoramic images the right way (even without a tripod). We’ll then jump into the most streamlined postproduction. You’ll learn how to assemble panoramic photos with either Lightroom or Photoshop. We’ll cover how to straighten your horizon and clone out gaps and mistakes with Photoshop. Plus you’ll learn how to get awesome contrast and color with Perfectly Clear. This amazing plugin for Photoshop and Lightroom really brings your images to life. During this event we’ll giveaway some great prizes including a copy of Perfectly Clear, a Platypod Pro, and a Creative Cloud Photographer’s Plan subscription. This event is totally free to attend thanks to the folks at Perfectly Clear. Where: Visit this page to sign up. You must be present to win. Why: To learn how to create panoramic photos and get the most out of Photoshop, Lightroom, and Perfectly Clear. Plus you can win some awesome prizes. To learn more about how Google Hangouts work, click here. Click Here to Sign Up and Watch!